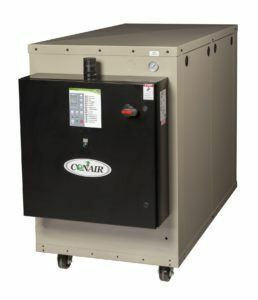 The first available with variable-speed compressors, new 10-ton and 20-ton EP2 Series portable chillers from Conair combine dramatic power savings with the versatility to efficiently handle a range of low, partial, and full chilling loads. In head-to-head tests against 10- and 20-ton chillers equipped with conventional fixed-speed and digital scroll compressors, EP2 Series Portable Chillers deliver energy savings of 20 to 50% in a range of realistic and low-load conditions. This option is available on both water-cooled and air-cooled models. 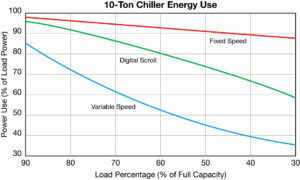 Chillers with conventional, fixed-speed compressors cannot adjust their cooling capacity by slowing down. Instead, they adapt to low-load conditions using a hot-gas bypass that creates an artificial load to prevent overcooling. Thus, at partial loads, energy savings are minimal. Newer digital scroll compressors show significant improvement over fixed-speed compressors, and can unload capacity to reduce power consumption for partial loads, but even the newest digital scroll compressors cannot match the efficiency of variable-speed compressors. 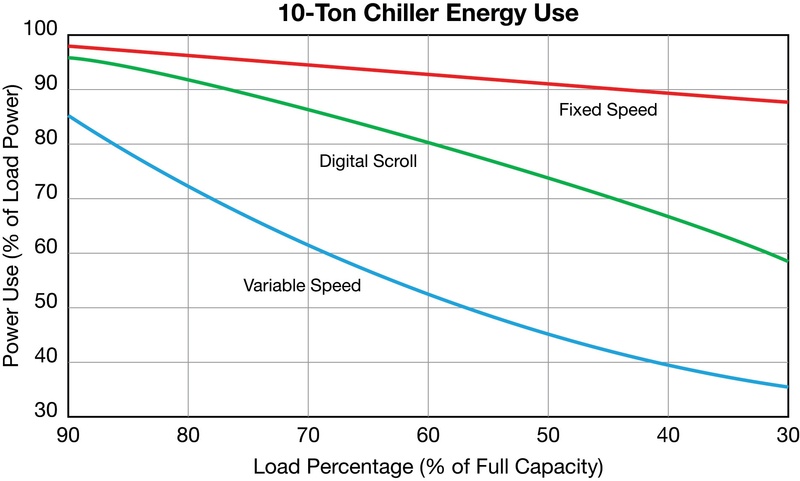 The graph above compares energy consumption for 10-ton chillers with fixed-speed, digital scroll and variable-speed compressors at various load percentages. It shows that a chiller with a single-speed compressor and hot-gas bypass uses 88% of full-load power when running at just 30% load and 94% of full-load power at 70% load. Equipped with a digital scroll compressor, the same chiller would use 58% of full-load power at 30% load and 86% of full-load power at a 70% load. However, the variable-speed compressor in the 10-ton EP2 Series chiller consumes just 36% of full-load power at a 30% load, and just 62% at a 70% load. This represents a direct relationship between power consumption and cooling demand. As noted, a 20-ton EP2 Series chiller combines a 10-ton variable-speed compressor with a 10-ton fixed speed compressor. Consequently, the energy savings compared to conventional single-speed chillers are not significant in the middle load range, where either compressor — fixed or variable — would be running at a full capacity of 10 tons. Otherwise, in the 3- to 8-ton range, and the 13- to 16-ton ranges, savings are still impressive, Tim Miller says. All Conair EP2 Series portable chillers with the variable-speed compressor option also include a premium touch-screen controller with simple, easy-to-use operational and diagnostic screens. EP2 Series chillers are built with premium components, including low-noise fans, stainless-steel brazed-plate evaporators, and sophisticated controls for unmatched performance and reliability. With cooling capacity provided with R-410A non-ozone depleting refrigerant, the EP2 series not only delivers exceptional power efficiency, but does so with the environment in mind. The Conair Group (www.conairgroup.com) is a leading global supplier of auxiliary equipment for plastics processors, including resin drying systems, blenders, feeders and material-conveying systems, temperature-control equipment and granulators. Extrusion solutions include line-control systems, film and sheet scrap-reclaim systems and downstream equipment for pipe and profile extrusion. Over 450 individual products solve problems, save energy, cut waste and are easy to use. Conair is also an international company, with long-standing operations in Europe, Asia and Latin America. The industry’s most complete product line, top-flight engineering and unbeatable service, all combine to give processors the confidence they need to succeed in today’s competitive global marketplace.